A few months ago, I had a friend and colleague call me and ask me the following question: “What happens to my student loans if I choose to get married?” In the same breath, she went on to explain that she had been delaying her marriage for months because she was fearful of how that would affect her finances. I can’t imagine how difficult it must have been for her, feeling like she had to choose between marrying the man who she describes as her “number one supporter and best friend”, or her student debt. The concern was that she and he both had student debt, and they were both currently under the loan forgiveness program. Which meant that separately, they were both paying a percentage of their income towards the loans. She feared that getting married meant combining their incomes which would create a higher total income number and which therefore would require them to make an even higher monthly payment on BOTH of their student loans. So here I am, walking through some of the basic info, just like I did with her on that far away phone call. I hate seeing student loans get in the way of, well, l i f e , and I want to say to all of you the same advice I said to her. Life is too short, for numbers to be the only factor. I hope this helps. We all know that we bring into our marriages our past experiences, the perceptions shaped by those events, and other baggage (suitcases of?) that we may be carrying. Student loans is more commonly becoming one of those suitcases, or if you’re like me, loads of suitcases. As student debt numbers continue on the rise, it seems to become a bigger deciding factor than ever before. The fact that student loans are preventing people from getting married seems ridiculous, but it’s a fact that exists none-the-less. My friend was not the first to delay getting married because of student debt concerns. In fact, I frequently get calls regarding student loans after a recent marriage. I have people all of a sudden interested in a CFP after tying the knot, because now, their professional pursuits are affecting other people they care about. More than that, it’s affecting their futures. I’ve spoken openly about how my own marriage is what motivated me to get rid of debt. In addition to marriage, I have had people confess that it’s prevented them from pursuing passions, changing career paths, buying a home, and also, starting a family. But it shouldn’t. Here’s how marriage affects those under the student loan forgiveness plan. Will my student debt affect my spouse? Technically, your student debt will only be tied to your name. Even if you get married, your spouse will not be responsible for paying off your debt. An exception to this rule is if you decide to refinance your loan and have your spouse co-sign. Co-signing puts your spouse on the hook for your loans. I would not recommend refinancing if it requires having someone else sign their name. I wouldn’t want to burden even my worst enemy with this debt. If you refrain from doing this, then the student debt will stay with whoever originally took out the loan, and that’s it. But it does not mean it won’t affect the other individual. Take my case for example. I have a student debt payment of $6,500 a month for almost ten years. That means that every month, that’s $6,500 less than what my spouse or I can use to live our life. It’s that much less that we can put towards paying down our mortgage, or setting aside to travel. Or, if my spouse hypothetically had loans of his own, then it would be $6,500 less that we can contribute to his debt. So the short answer is yes. It does affect your spouse and family in the grand scheme of things. Which was my number one motivator to get rid of the debt faster than they can be forgiven. If both individuals have student debt, should the student loans be consolidated? They say that when you become married, you become one. Everything gets joined together, finances included. Most married couples decide to combine bank accounts to simplify life. “It’s all half-and-half now anyway.” So some ask, shall we also consolidate student debt. I would put the brakes on this one. While there are some pros, it could also be harmful too. Let’s consider both sides of the coin. A positive of loan consolidation occurs when one spouse has a significantly higher credit score than the other. Since interest rates are determined by credit score, the individual with a really low credit score might benefit from consolidation. Merging debts can also be beneficial in terms of simplicity. When loans are consolidated, you no longer have to worry about your tax filing status when tax season rolls around. Additionally, you would reap similar benefits as if you refinanced your loan. These include lowering your interest rate, lowering your monthly payments, adjusting your length of repayment term, and therefore decreasing your total number of monthly payments. Lastly, it will get rid of having to juggle multiple loan servicers at the same time. Out of all this, I think the most beneficial aspect (for me anyway) is the psychology of combining student debt. When things remain separate, it sometimes happens that one person will hold a grudge against the person with the higher debt. This can either be a silent sentiment, or one that gets voiced more and more frequently as the time passes. Consolidating loans at the get-go is a symbol of both individuals wanting to work together to get rid of the debt. Regardless of how much there is to pay back, both are putting their hard earned pay towards the loans once they are consolidated, and the adversity can unite rather than divide. That being said, I would be wary of loan consolidation, especially for those under the Public Loan Forgiveness program and the 25 or 30-year Loan Forgiveness Program. First and foremost, loan consolidation of any kind usually resets the clock for the loan. This affects those in PLF because their 10-year service to a company may be reset as well. I have talked to nurses who have been unfortunate enough to consolidate their loans after working at a hospital under PLF for multiple years. By doing so, their previous years’ contributions to the hospital did not count towards PLF, and after loan consolidation, they have to contribute another 10 years in order to qualify for forgiveness! Additionally, most lenders who will consolidate multiple student loans are private lenders. By consolidating with a private lender, you will lose the ability to qualify (ever-again) with a 25 or 30 year loan forgiveness program! This is all fine and dandy if the private lender gives you a lower interest rate that would allow you guys to keep up with the payments. But take my case, for example. We heavily considered refinancing my student debt, and I drawled on about our wishes to do so in this post. In the end, we did not pull through with refinancing, firstly because they required Mike to co-sign (see above) and secondly, because it would forever prevent us from falling back on loan forgiveness. That would mean that even with a lower interest rate, it would require us to pay $5,500 a month every month for 8 years. Currently, 100% of my dental income goes towards paying down the debt. If something were to happen to me, say I broke my wrist while baking, that would prevent me from working, and we would be screwed! By not refinancing with a public loan lender, my monthly payments are only a small percentage of my income, and we can manage that payment in case temporary (or permanent) disability occurs (applicable also to natural disasters, personal conflicts, and job insecurity). In the end, we chose flexibility and peace of mind over money. I think that consolidation would be more beneficial as the student loan amount decreases and the pay increases. You have to just run numbers with your own personal situation to see what the risk is, and if it’s worth the cost. If both individuals are on the student loan forgiveness program, how can they keep their monthly payments to a minimum? Sometimes, when people choose to get married, both individuals have student debt under their names. If they are both under the student loan forgiveness plan, then they are currently paying a small percentage of their reported income based off of the previous tax year. The concern most people have is that when you get married, the student loan forgiveness plan may or may not consider your total household income. For example, currently, you may be paying 10% of $10,000 (just to make the numbers easy) per month. That’s $1,000 a month towards student debt. And your husband may be paying 10% of $10,000 a month as well. But when you get married, now your household income is $20,000 a month. Will you both be responsible for $2,000 contributions to each of your loans? First off, if you both are in this situation, you should probably consider filing separately. If your monthly payments are dependent on your income, then filing separately will help lower the total monthly payment, because it will be based on only one person’s income. Remember that under the student loan forgiveness program, you want to pay AS LITTLE AS POSSIBLE, and you want the government to forgive as much as possible. I follow up that last paragraph with this caveat. Not all married couples on the loan forgiveness program should file taxes separately. Here’s the thing. You may get a lower monthly student loan payment by lowering your total income. However, choosing to file taxes separately will likely lead to higher taxes. So even though you are paying less towards your student loans, you may find that your monthly savings will not be worth the extra amount you have to dish out come tax season. The only way to really know which situation is best for you is to run the numbers. You need to compare the savings you get from having a lower income to base your student loan monthly payments with the additional taxes you would pay by filing separately. Unless you are a tax whiz, this is the part where I refer you to an accountant. Or talk it through with my pal Travis at Student Loan Planner. As you can tell from our conversation at this Itunes Podcast recording, I may know a little bit about student loan repayment, but Travis is the guru. Even he pointed out ways to optimize my own plan, which we used to save thousands of dollars. There is one situation where your tax filing status does not matter as much. This is the situation Mike and I fell under. My loan is under the loan forgiveness program but we decided to file our taxes jointly. The reason is that although we are under the loan forgiveness program, we are trying to still pay my debt down aggressively and as quickly as possible. We stayed under the loan forgiveness program in case of a financial crisis or emergency… essentially, for peace of mind. However, we have all plans to pay it down like a standard loan payment. By filing jointly, we reap the tax savings of being married. Even though our total household income is greater and our minimum monthly payments are larger, our total monthly payments are aggressive and far exceed our minimum monthly payments anyways, so our total household income becomes null. Which is the perfect example to show that every choice behind what to do with the loans is entirely situational. It requires a good grasp on your financial abilities and your personal goals, while considering the best path for your psychological well-being. For, let’s face it, a lot of the motivation comes from the mind, and any long-term progress will highly depend on how “right” everything feels to you. The moral of the story is this: Instead of fearing marriage as being an impediment to your financial journey, or vice versa, use them as tools to fuel each other. My marriage is what inspired me to be extremely aggressive in my student loan repayment. In much the same way, my student loans have ironically strengthened our relationship. For the first year, we sweated, cried, and rejoiced over battles and victories regarding debt. We’ve learned to work together as a team, stretched our creative boundaries, and really stood our ground, hand-in-hand, against nay-sayers, financial instabilities at work, and plain old exhaustion. We hit walls that we never thought we could surpass, only to climb over mountains. I think everyone can do the same, too. And if you need someone to simply talk to, to rant or cry, know that I am here. And so are all the other people who have reached out to me. We are all going through a similar journey, but I want us all to feel empowered, not struck down by the weight. I want to a be collective, rather than lonely individuals. I want you to succeed, not in being rich, but in your pursuit for a happy life. Today, my Itunes interview with Travis Hornsby was released, and it will leave you with much to mull over. Travis Hornsby is the founder of Student Loan Planner, whose goal is to help guide recent grads down the correct repayment path for their lifestyle . In this episode, he dissects my current student loan repayment plan. We discuss optimized strategies, loopholes in the system, as well as pros and cons with paying down debt aggressively or passively. I learned something new during my conversation with Travis which led me to switch my repayment plan in order to save thousands of dollars! Throughout this journey, I have found that it’s amazing that we don’t know what we don’t know. Without conversations such as these, we will never really be making the best choice available. Additionally, it secures my faith in our ability to pursue our path and reinforces the contentment that I have with our decision. There are a few things that we touched on in the podcast that I wanted to clarify. Mr. Debtist and I both have 401ks. We are not paying down the debt and ignoring retirement all together. We contribute to our 401ks every month and currently have more than $100k tucked away. We bought our property but not just as a place to live. We knew before we purchased that property ownership is FOR US. Our property is very unique. It is a live work loft that has a commercially zoned business space on the first floor, and the living space on the second floor. We bought it as a means to increase our income. Even though Travis is wary of people buying at more than the 1% rule, especially in California, the conversation we had talks specifically about homes to live in. It does not take into account the money the house brings in on top of its worth. We currently make passive income off of the business space by renting out the room. If ever our roommate leaves, we have a few ideas on what to do with the space. Our hope is to eventually create a business of our own on the lower floor, thus adding to the ways in which the house makes us money. As much as I would love to work pro bono in another country, I want to be rid of the loans more. I know that it seems crazy to forever pay $6,500 towards student loans every month for 8 years, but I trust that it will not be equivalent to what we are paying now forever. I believe in the snowball effect. As we alluded to in the podcast, once the loans are at a certain threshhold (less than $400k) there is the possibility of refinancing at 5.5%. Once it’s below $300k, there’s the possibility of refinancing at an even lower rate. Additionally, we hope to increase our income over time, as we are doing a number of side hustles. Lastly, as Travis tried to convince me to get on the forgiveness path, you can see that he did so to no avail. I am certain we are on the correct path for us. Once we are free of debt, we would have already been contributing to both 401ks for 8 years, paid as many years to a mortgage, established at least one consistent stream of passive income in the form of a side gig or business, and most importantly, we would know how to live off of very little. We know how to find happiness in the simple things. We would have created a life of intention. And that is worth more than anything a loan forgiveness program could give me. This is definitely a podcast to listen to if you graduated with a large student debt. You will likely find some golden nuggets in our conversation, and if you like what you hear, then maybe scheduling a call with Travis would be the next step for you. If you have a smaller student loan amount, maybe getting rid of your debt is closer to your reach than you think. In case you were considering refinancing, below are a few refinance links, to help you get a better rate on your refinance. Using the links above will reward you with a sign up bonus for choosing to re-finance. But before you do, please think thoroughly about whether or not you can sustain the new rates, because once you refinance, there is no going back to student repayment. Also, don’t forget to shop around and find the lender that will give you the best deal out there! And in case you missed it, my previous podcast interview on Itunes with ChooseFI can be found here. How Switching Your Student Loan Forgiveness Plan Can Save You Thousands of Dollars! How would you like to save thousands of dollars a year, simply by switching the loan forgiveness program you are on? We know we did! A recent conversation with Travis Hornsby of Student Loan Planner informed us that we could speed up our loan repayment simply by switching from IBR to REPAYE! The information that Travis shared with us was so valuable, because it could in fact save us thousands of dollars on our student loans! That’s equivalent to refinancing to a lower rate, thus cutting down our repayment timeline, while still allowing us the safety net of being in a loan forgiveness program. After conversing with Travis for an hour, I would highly recommend Student Loan Planner as the starting point for any student or new grad looking for student debt advice. So how do we save $$$ this year? It’s simple. All we need to do is to switch from IBR to REPAYE. Today, I will outline why. We were under the IBR program since we embarked on this journey to repay our student debt of $574,000. Before you consider which loan forgiveness program you want to choose, you should probably read Finance: Student Loan Forgiveness Options: IBR VS PAYE VS REPAYE. We had initially chosen IBR despite the fact that the monthly payments would be 15% of discretionary income vs REPAYE’s 10% of discretionary income because of this one factor: IBR allows you to file taxes separately as a married couple and it will only consider the loan holder’s income, versus REPAYE which will consider the income of your spouse as well. Since Mr. Debtist also makes a six figure number, we figure that we would have the better deal using solely my income. Let’s use estimates from our personal story to calculate the difference. Assume that our loan is an even $550,000, my income (the debt holder) is $125,000 and Mr. Debtist’s income is $120,000. Under IBR, they would calculate our yearly loan payment by multiplying my income by 15%. Now we divide that by 12 months to find the monthly payment. Therefore our monthly payment would be $1,562.50 under IBR. Under REPAYE, we need to use the total household income of $245,000 to calculate the yearly payment, however we will only be paying 10% of our household income. To find the monthly payment, divide by 12 months. Therefore our monthly payment would be $1,835 under REPAYE. As you can see from this example, IBR would be the better payment plan because you would be paying the cheapest amount per month and allowing the program to forgive as much as possible. HOWEVER, there is a rule with REPAYE that IBR does not have. REPAYE will subsidize 100% of the interest accrued for the first three years for subsidized loans, and 50% of the interest accrued after the first three years, which changes the game. Note, if you have unsubsidized loans or GRAD PLUS loans, they will only pay 50% of the interest accrued, period. Let’s see how. Under REPAYE, the government will subsidize the interest that does not get covered by your minimum payment. In my case, I took out GRAD PLUS loans, so that would be 50% of the interest that accrues. We have already calculated the monthly payment to be $1,835.90. Let’s convert that to yearly payments. This year, based on last year’s income, we owe $22,030.85 in total payments under REPAYE. We also know that interest on $550,000 at 7% is $38,500. Therefore, our payments under REPAYE are not even enough to cover interest, as is usually the case with a loan this large. Which means that for our case, the government will subsidize over $8k per year! You would be missing out on thousands of dollars just by being on the wrong program! We certainly did. We decided to be under IBR right when I got out of dental school, BEFORE we decided to pay back our loans aggressively. The reason being in my first year, I only worked for the last three months of the year, having waited for my license to be approved after graduating in June. In my first year’s taxes, I made $25,000. So taking 15% of $25,000 would be cheaper than 10% of $145,000. Now in the second year, the numbers completely changed since I started working full time for the entire twelve months. My salary jumped from $25,000 to $125,000. The ultimate question: Why didn’t we make the switch? In April of my first full year of work, we had decided to pay back the loans aggressively. Meaning, our monthly payments were MORE THAN the minimum amount required. In order for there to be excess interest accrued on the loan, our monthly payments should not exceed the interest gained, which was about $3,000. But since we were paying our debt like CRAZY, we were actually paying $6,500 towards the loans, so no interest was accruing and it did not matter if we stayed in IBR or went to REPAYE. According to Travis Hornsby of Student Loan Planner, REPAYE calculates the difference between the interest accrued and the amount paid back on the loan at the beginning of the year. REPAYE assumes that you will only make your minimal payment each month, which means that they lock in the assumption that $11,500 would be accruing in interest (for our particular example). Every month, they will subsidize a portion of your loan to make up for the interest that will supposedly accrue, REGARDLESS OF THE MONTHLY PAYMENT YOU ACTUALLY PAY. It doesn’t matter if we pay $6,500 towards the loans or if we pay the minimum amount. Either way, REPAYE will subsidize the difference between the minimum payment and the interest that’s being charged. So we have actually missed out on an opportunity here! What’s passed is past, but we are definitely jumping from IBR to REPAYE ASAP! What Switching from IBR to REPAYE will save us. It will save us tens of thousands of dollars in the long run. Making the change will be the equivalent of refinancing to a lower rate without actually having to refinance! Which then gives us the safety net of staying in a loan forgiveness program. If ever life throws us a curveball (such as an accident, layoff, disability, sickness, or our worlds fall into chaos and we cannot work), then the loan forgiveness program will give us the flexibility to not HAVE to pay $6,500 per month. After all the money we save, we can cut our repayment timeline down to 7.5 years! Off course, not everyone under IBR should automatically jump to REPAYE! You have to pick the financial path that is right for you, considering your personality, your goals, your lifestyle, and more. 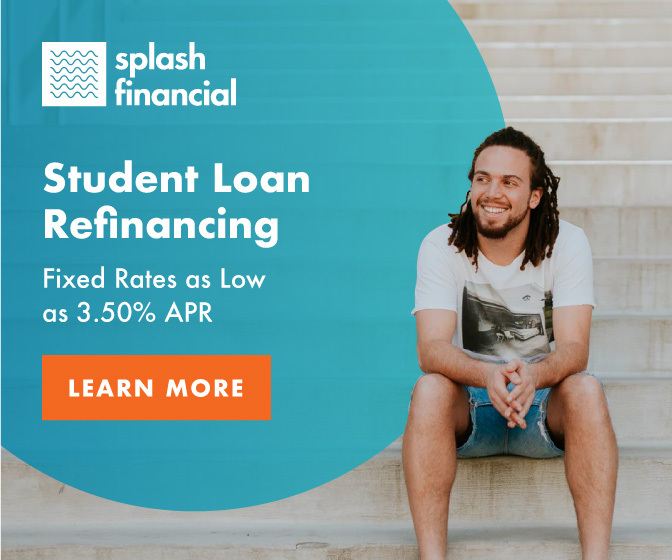 If you are looking for sound advice on how to create a student loan repayment plan customized for your situation, don’t hesitate to contact Travis Hornsby, founder of Student Loan Planner, using my affiliate link. It will be a very rewarding hour! And check out my second podcast episode with Travis, to be released in 2019! Stay tuned. As you all know, we’re in the midst of refinancing my gigantic student loan! We started at $575,000 and in one year, reduced the total to under $500,000. I have shared why we decided to refinance, and what the hold-up has been since then. Now it’s actually time to bite the bullet. There are many companies to choose from, and what is necessarily best one person isn’t the best for another. Therefore, there is no one formula or equation that would allow me to tell you the refinancing agency you should go with. My advice is to do what we did — shop around! Figuring out which refinancing company is best for you is easy. You can visit a number of them online and get a quote. Here are some decisions you’ll have to make. Fixed interest rate vs variable interest rate: I like the stability of a fixed interest rate, even though variable interest rates give you a lower rate initially. Unfortunately, you may find that low rate changing as time goes on, a surprise I am not willing to chance. Number of years for repayment: You can also choose the number of years you want to take paying down the loan. They may offer you anywhere from 5 to 20 years. If you are refinancing out of IBR like I am, the smartest choice will be to choose the least number of years as you can comfortably pay… except for one exception. If they offer you a lower rate at 10 years instead of 5 years, then I would take the 10 year option at the lower rate, and simply pay it down more aggressively, so that you still finish in five years. It’s a way to take advantage of a lower interest rate! The amount of your loan you will refinance: I put this here because sometimes you simply can not refinance your loans in its entirety. For example, some of the companies that we looked into max out at $300,000. Some are even career-dependent or level-of-education-dependent, and cap at lower numbers such as $150,000. This caveat specifically applies to us, because my loan is so huge! In fact, I have not found any lenders to date that would refinance more than $500,000 of student debt, which is why it was so important for us to pay down my debt until it was under $500,000. Now that you’ve made some decisions, it’s time to make the big decision: Which lender? I would recommend going to each of the following websites below to see what they can do for your specific case. A pre-application will at least give you a rough ballpark estimate of what they can do for you. Below, you will find some affiliate links to each of the companies we explored. Once you refinance out of IBR, you cannot re-enter IBR again. I’ve spoken of this before, but please make sure that you are able to pay the required monthly payments under the newly refinanced loan. I would like for you to consider any possible complications that may occur over the repayment timeline. If you or your spouse experience disability, will you still be able to pay? If you have a lifestyle change, such as an addition to your family, or move to a different city because of your job, would it still be doable? The last thing you want to do is refinance and get yourself stuck with a payment that you won’t be able to make. Off course, no one ever knows what the future holds, but try to ensure you have a fallback plan in place. Pre-application rates have expiration dates. You can fill out a pre-application form, but do know that they have an expiration date. The quoted interest rates may change if you wait too long to go through with the refinancing process. Rates are always changing. Do not be surprised if you re-apply after your first application has expired, only to find a higher rate than before. If there is a rate you really like because it is very low, I would say move quickly, or risk losing it. Of the same token, don’t start gathering rates until you are absolutely sure you are ready to re-finance. Soft credit pulls do not affect your credit score. Some pre-applications may request making a soft pull on your credit report. These will not affect your credit score, however, if they request making a hard pull, then that will have some effect. Therefore, you want to avoid hard credit pulls unless you are 100% sure that you will be going with a particular company. I have discussed how credit scores work once before. Do not add your spouse as a cosigner unless you are willing to tie them down to your debt for life. Consider this gruesome inquiry: What happens to your student loans in case you pass away? A conversation I implore everyone to have. If your spouse co-signs with you on that refinanced loan, if you happen to pass, then your spouse is still on the hook to continue paying back that debt. If, perchance your spouse does not co-sign, should you pass away, that debt is erased. Off course, you must read the fine print of the contract they send you to confirm this, but that is something to consider. You may receive a lower rate with a co-signer, but is that worth it? Maybe for some whose loans don’t approach half a million dollars, but for us, I don’t think so.